The staircase not only connects multiple levels but is a central focal point in your home. 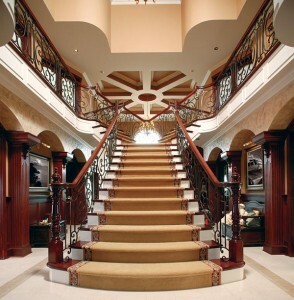 The staircase is a perfect remodeling project which make a major impact in your home’s appearance. 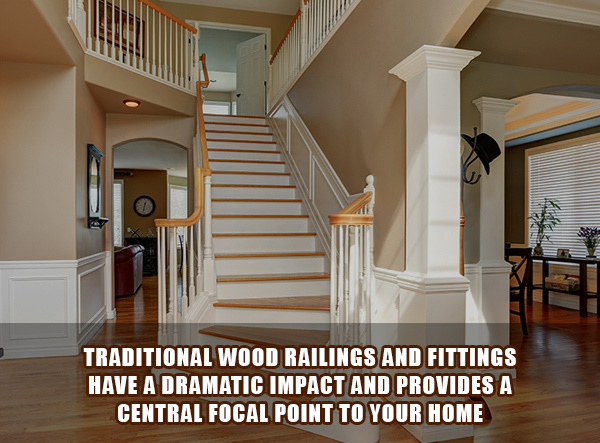 Bring the heritage of American craftsmanship to your home this winter by installing a traditional wood railing with natural wood fittings. In this article, the ASA team will discuss how you can plan to use traditional wood railings and fittings in your home. Homeowners are installing traditional wood railings like never before, though the variety of styles, colors, and designs continue to expand. From low to high polish finishes, traditional wood can be selected to match nearly any color within your home, and the use of high quality stains can combine color and strength needed for long term use. Standard beveled railings from top end manufacturers like L.J. Smith come in a variety of styles to meet your exact needs. You can opt for a style with a smooth rounded finish to create delightful lines, or opt for a more pronounced design. Handrail fittings by L.J. Smith are both versatile and built to match. The manufacturer’s unique approach to joint connections require zero rail bolts, and strengthen railings with their robust hardware. Traditional wood railings offer homeowners a variety of advantages over other materials with its cost savings, beautiful natural colors, and durability. Your family can trust railings built by L.J. Smith, and can use them for decades to come. For more information on traditional wood railings we invite you to contact us or stop by ASA Builders showroom.